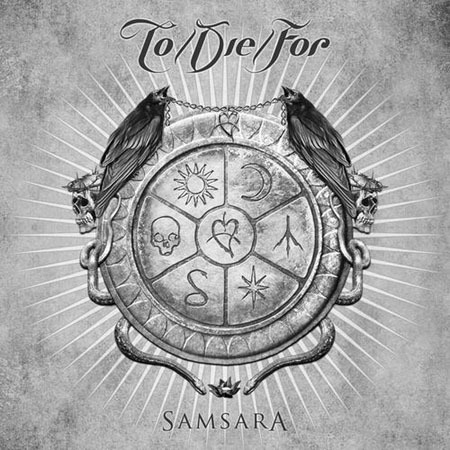 » Originally self-released last December, “Samsara” was now re-released via Massacre Records, after To/Die/For signed with the German label somewhere in April. Personally, I’m pleased with such news, as this is one of the band’s best works so far and it really deserves world-wide distribution. And while “one of the best works” may be just my opinion, I don’t think anyone can disagree on this being their heaviest album. The opening track, “Kissing The Flames”, and “Hail Of Bullets” are the best examples of that. And even in softer, more goth tracks such as “Someday, Somewhere, Somehow” or “Love’s A Sickness”, the parts where the rhythm speeds up are stronger than ever. They also go a bit experimental here, with “Oblivion: Vision” making you wonder about what the hell is going on. The rest of the “experiments” are less drastic: in “Death Comes In March” they try the simplicity of an acoustic guitar alone, with a very heartbroken voice. It almost makes you feel as if the track was spontaneously recorded in just one take. Nothing you would expect from a goth rock band, not as a “main” song anyway – a hidden bonus track, maybe. And in “Damned Rapture” they go beyond the depressive mood, typically gothic, and deliver a totally obscure composition. “Folie Au Deux”, on the other hand, is a hard rock ballad, with guitars that seem to be weeping. And the “angels” choir is just wonderful, as well as the last minute and a half, completely instrumental. I’m not very much into long songs, but this one, despite its more than seven minutes, is definitely a favourite.